Home to 44 higher education institutions, New Mexico serves a diverse population of students. In 2015, nearly 54,000 students enrolled in at least one online course. This total represents 38.8% of New Mexico's student body, an 11% growth in online enrollment that surpasses the national average by 9.1%. The number of New Mexico students taking all of their coursework online also surpasses the 14.2% national average at 16.2%. In 2017, the New Mexico Higher Education Department (HED) discovered that excess credit accumulation prohibited students from timely graduation dates. Therefore, the HED modified policies to ensure that students can complete mandatory coursework within two-year and four-year time frames for associate and bachelor programs, respectively. HED now confirms that 19 institutions offer programs following these guidelines. Additionally, the New Mexico HED's standardized advanced placement (AP) credit acceptance policy assists students with earning their degrees faster and cheaper. Collectively, New Mexico students saved nearly $4.26 million in tuition in 2017. In addition to other tuition breaks, this guide includes information regarding the best online colleges in New Mexico and the current job outlook for graduates. According to the National Center for Education Statistics (NCES), New Mexico students can choose from 28 public, three nonprofit, and 12 for-profit colleges and universities. NCES data also shows that in 2016, 19,841,010 students completed coursework at degree-granting postsecondary institutions across the United States. Among these students, 134,610 belonged to schools in New Mexico. While the Department of Education in New Mexico strives to provide affordable solutions for higher education students both locally and nationally, out-of-state students should still consider how residency impacts tuition costs. College Board data for the 2018-2019 school year indicates that the average tuition price at a public university in New Mexico costs $7,130, while out-of-state tuition can reach above $20,000 per year. In fact, the University of New Mexico, the state’s flagship school, currently costs $7,320 for residents and $22,590 for non-residents per year. New Mexico students can obtain funding for school from multiple sources. Data provided by the National Association of State Student Grant and Aid Programs indicates that New Mexico provided $91,316,820 in aid to students during the 2015-2016 school year, $31,823,820 of which went to need-based programs like grants and work-study. Another $59,131,900 supported merit-based programs including athletic, lottery, and competitive scholarships. The remaining money supported programs that consider both need and merit, which include legislative endowments and New Mexico scholars. According to 2015 Online Learning Survey data, nearly 39% of New Mexico students enrolled in at least one online course, which represents an 11% increase since 2012. Furthermore, 18,715 undergraduate students and 3,670 graduates enrolled in 100% online colleges in New Mexico, which represents 16.2% of the state’s higher education student population. Many students earning their degree from online schools in New Mexico live in the state. In fact, 78.3% of distance learners live in New Mexico, while the national average hovers around 55%. On the other hand, some students prefer a combination of in-person and distance learning class environments. Nearly 116,000 students utilize digital and online class environments each year, a 3.2% decrease from previous years. Most students attending online colleges in New Mexico enroll in large public schools; however, medium-sized institutions with less than 10,000 admitted applicants represent the second largest concentration of student enrollment. In fact, public schools account for 64% of the student population, private institutions account for 29%, and nonprofits account for 7%. That said, 97% of distance learners choose public online schools in New Mexico. Students considering online colleges in New Mexico should familiarize themselves with the New Mexico Learning Network (NMLN), which helps educators and students communicate effectively. Over the past 18 years, the NMLN has recruited 20 schools across the state to combine resources that help distance learners in New Mexico. This technology includes internet conferencing and interactive tools. Distance learners often look for the best and most affordable programs. If their state does not harbor a school with their ideal program, students may need to select out-of-state schools that charge higher tuition rates. As such, the Western Interstate Commission for Higher Education (WICHE) emerged in the 1950’s with the goal of pooling resources from multiple institutions — ultimately leading to the Western Undergraduate Exchange (WUE). Students residing in states affiliated with the WUE program pay no more than 150% of resident tuition rates at online colleges in New Mexico, saving them up to $9,000 per year. Students in affiliated states qualify for WUE despite financial need. Some schools also offer additional discounted rates. Schools can limit the number of students they admit each year, so WUE applicants need to submit their applications earlier than other students. Participating states include Alaska, Arizona, California, Colorado, Hawaii, Idaho, Montana, Nevada, New Mexico, North Dakota, Oregon, South Dakota, Utah, Washington, Wyoming, and U.S Pacific territories and freely associated states. Below, you will find our rankings of the best online four-year programs in New Mexico. Our profiles look at how schools approach online education and then list out their services for distance students and their popular, fully online degrees. After reviewing the best online schools in New Mexico, explore our state resources, like a database of every college and university in New Mexico or our index of popular in-state scholarships. Eastern New Mexico University in Portales, New Mexico educated more than 6,000 students in the fall of 2018. The student population represents 51 states and territories, along with nearly 30 countries. ENMU boasts a 97% satisfaction rate from learners. In addition to the four-year campus, there are two-year schools in Roswell and Ruidoso. ENMU ranks among the best online colleges in New Mexico, with over 30 available degrees. Students can choose from 20 online bachelor's programs in fields like accounting, criminal justice, hospitality management, social work, and history. ENMU also offers 14 online master's degrees, including a master of business administration, master of arts in communication, and multiple options for a master of education. Candidates can also pursue online certificates, endorsements, and minors. Candidates can download free tools and software from the school's library, such as Zotero and Evernote, and may use textbooks for free. Learners can also view course documents placed on reserve and use a library passport to explore other New Mexico campus libraries. The university provides counseling for online students. The Office of Distance Learning permits high schools students to earn college credit through dual enrollment, like New Mexico junior college online courses. Students can also enroll in non-credit courses, including law school preparation and SAT preparation classes, along with certification courses on topics such as victim advocacy and legal investigation. Texas learners within 135 miles of the school may enroll in these New Mexico online college courses and qualify for resident tuition. ENMU boasts accreditation from the Higher Learning Commission. Located in Hobbs, the University of the Southwest offers online programs that rank on two U.S. News and World Report lists: top online education programs and top online business programs. This private university delivers curriculum grounded its Christian heritage. USW delivers a master of business administration (MBA) online in subjects such as accounting, finance, healthcare administration, human resource management, and law enforcement and corrections. Candidates can earn an MBA in a year, with professional and military accomplishments applying toward the required 36 credits. A bachelor's in business is not required for admission, though students may earn their bachelor's online through the university. Other undergraduate courses available online include law, sociology, communication, biology, and religion classes. USW also offers a master of science in education online in the following specializations: education specialist, exercise science, school counseling, and special education. Learners can also pursue a doctor of business administration completely online. Tuition charges for USW include textbook costs and technological fees for some programs, and the school does not charge an application fee. The institution provides students with laptops, and over 80% of USW learners use financial aid. These features make USW a financially sound opportunity, particularly since out-of-state learners do not automatically pay extra tuition. The school connects students to online resources -- such as labs and academic websites -- for guidance on grammar, statistics, science, and citation. USW's library also provides academic resources on poetry, science, and history through research, articles, and database access. SWU is a Yellow Ribbon School, this means veterans can obtain financial assistance that may include all tuition and fees. The school also holds accreditation from the Higher Learning Commission. New Mexico State University, originally called Las Cruces College, was established in 1888. The institution is a NASA Space Grant College that educates more than 15,000 learners from nearly all U.S. states and some 89 countries. 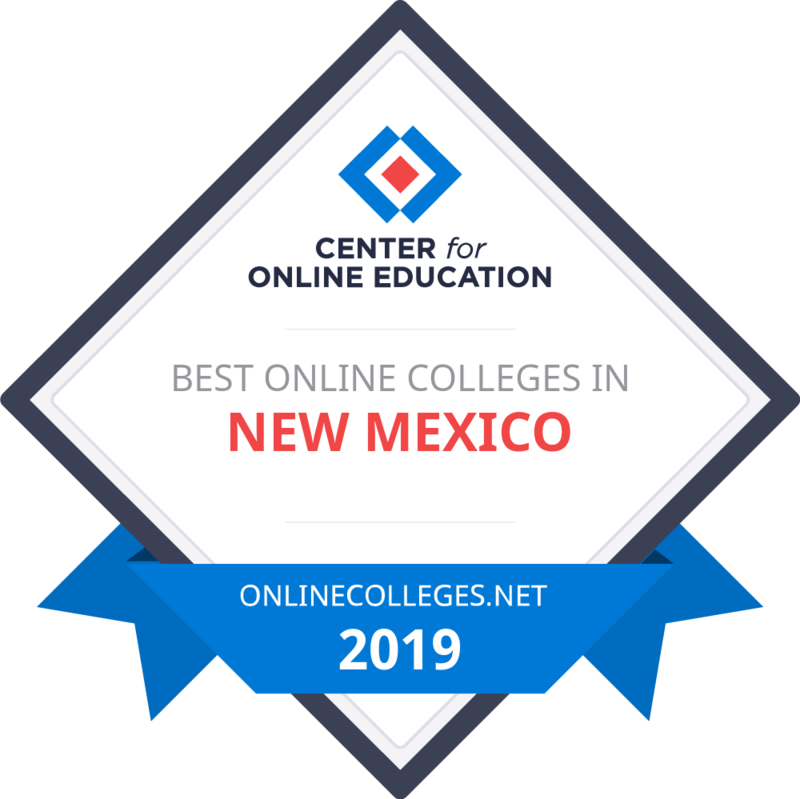 This school ranks among the top online colleges in New Mexico by providing programs through online classes, interactive television, and faculty exchanges. NMSU also delivers classes on external campuses. NMSU offers educators access to the Course Development Institute where they find guidance on building virtual classes. Professors may also participate in the Online Course Improvement Program with workshops and events such as Quality in Online Education Conferences. Here, educators learn to tailor instructional methods and materials to reflect >Quality Matters standards. Candidates can pursue a bachelor's, master's, endorsement, or certificate online in fields such as sociology, business administration, criminal justice, systems engineering, public healthcare, and music education. However, coursework may include synchronous participation, meaning learners may need to attend classes at set times. Programs may also involve residency components at the Las Cruces campus. Hybrid students can also obtain doctoral degrees in education and nursing, and interactive television learners may earn a bachelor's in elementary education. Candidates should explore the school's degrees for guidance on individual program structures and requirements. The university's degree completion opportunity allows candidates with two years of college to earn a bachelor's by finishing upper-division courses, which speeds up graduation time. The school's library provides resources for distance students, including an eBook collection, online articles, and citation tools. Students can also explore library tutorials on research tips and obtain books from local libraries through the Interlibrary Loan program. Distance learners pay a course delivery fee of $35 per credit, in addition to tuition costs. NMSU holds accreditation from the Council for Higher Education Accreditation and the Higher Learning Commission. Western New Mexico University in Silver City was established in 1893 and currently educates over 3,000 students from 18 countries. The school is a member of the American Library Association, the Hispanic Association of Colleges and Universities, and the American Association of University Women. Undergraduate distance learners may choose from fields such as chemical dependency counseling, criminal justice, education, social work, nursing, and business. Learners may also pursue an interdisciplinary/liberal studies degree that allows them to shape a program for their individual interests. Online graduate programs include master's degrees in business administration, teaching, nursing, social work, and interdisciplinary studies. Online students can pursue these associate, bachelor's, and master's degrees primarily through asynchronous classes. However, some departments require candidates to participate in synchronous web conferences or to fulfill on-campus components. Class sizes reflect an 18:1 ratio of students to faculty, with more than 200 classes delivered online each term. WNMU learners benefit from virtual tutoring through Smarthinking and online library resources, including eBooks and databases. The university also provides online advising for distance learners. WNMU offers guaranteed tuition rates where, if students maintain a minimum GPA and complete specified credit loads, their tuition never increases. Specifically, undergraduates must complete 30 credits per year with a 2.0 GPA, and graduate learners need 18 credits and a 3.0 GPA. Degree seekers from certain states may also qualify for waivers to earn in-state tuition rates. Military veterans and their immediate families can also obtain financial assistance through various programs, including the Post 9/11 GI Bill®, the Montgomery GI Bill®, and Survivors' and Dependents' Educational Assistance. WNMU holds accreditation through the Higher Learning Commission, the National Council for Accreditation of Teacher Education, the Association of Collegiate Business Schools, and the New Mexico State Board of Education. Below you’ll find another list of the top online colleges in New Mexico, sorted by lowest tuition rate. 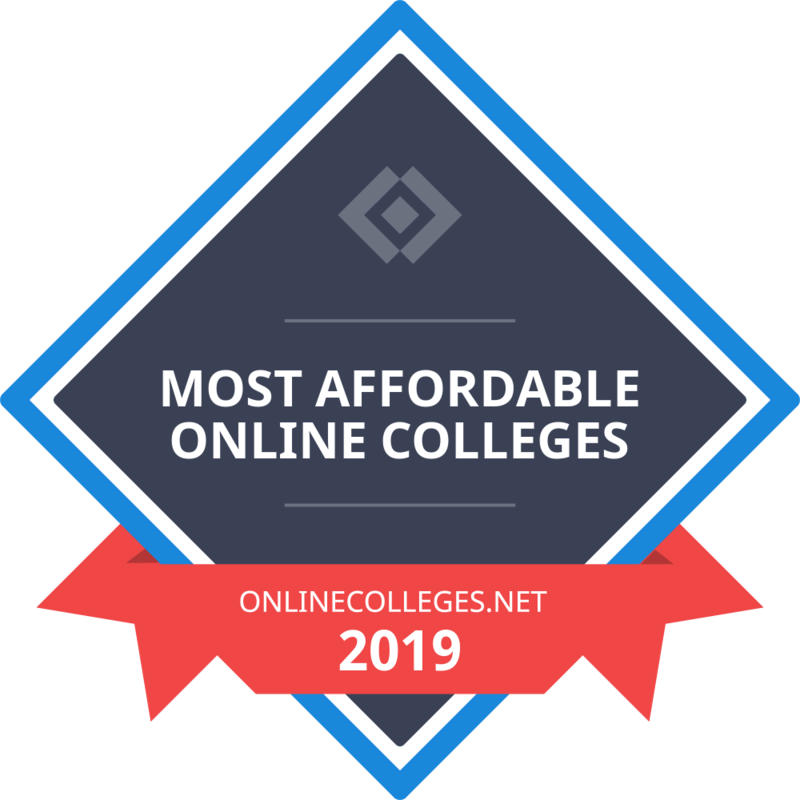 Our list of the most affordable online schools in New Mexico is based on in-state yearly tuition, or annual tuition rates if a school does not differentiate between in-state and out-of-state students. Tuition rates are based on a full course load each semester or term. All colleges on the list offer at least one bachelor's degree completion program available entirely online. The online schools in NM with the lowest tuition are ranked highest, providing prospective students with a true list of the most affordable online colleges in their state. Students considering a career in New Mexico should examine the job market. According to the Bureau of Labor Statistics (BLS), New Mexico professionals earn an average of $44,840 per year; moreover, the unemployment rate rests at 4.6%. However, since employment rates vary by industry, students should determine whether New Mexico can support their specific career goals. Key industries include energy and natural resources, aerospace and defense, food processing, distributions, logistics, transportation, advanced manufacturing, digital media, and business operation centers. In particular, the energy and natural resources found in New Mexico allow the state to remain one of the top 10 energy suppliers in the nation for gas, oil, biofuel, solar, and wind. Additionally, the climate supports needs for testing facilities and restricted airspace, which allows the state to harbor many aerospace organizations, including the first FAA-sanctioned UAS test center and Spaceport America. New Mexico also harbors three national research laboratories and acclaimed research institutions, which offer students valuable practical experience. New Mexico residents who graduate within the top 5% of their high school class may apply. Applicants must also score at least a 25 on the ACT and a 1140 on the SAT. This award is open to New Mexico undergraduate students who are pursuing education in Automotive Technology or related Applied Technologies. The maximum award is $1,000 per year; it may be used at a community college, technical institute, or four-year college or university. Funds are administered by the Albuquerque Community Foundation. Graduates of Albuquerque high schools who plan to attend a New Mexico school may apply. Students must hold a 3.0 GPA and score a minimum 23 on the ACT. The New Mexico Society for Respiratory Care awards this scholarship to aspiring respiratory therapists attending local universities. Students must hold a minimum 2.5 GPA. The Higher Education Department (HED) of New Mexico offers this scholarship to underrepresented students who can prove financial need. Students must live in New Mexico to apply. Aspiring library and information science professionals. Both full-time and part-time students may apply at either the bachelor's or the master's level. New Mexico residents enrolled in four-year programs at nonprofit or public institutions may apply. Acceptable majors include marketing, journalism, public relations, advertising, and strategic communications. Students ages 25 or older working full-time in Bernalillo, Sandoval, Valencia, Torrance, or Santa Fe county may apply. Students may renew this scholarship each year and requires a minimum 2.8 GPA. The HED of New Mexico offers this scholarship to New Mexico residents who have graduated from a local high school. Students must possess a minimum 3.0 GPA. Any student planning to earn their bachelor's degree at an accredited public university in New Mexico may apply. Students must enroll full-time and meet GPA standards. Any student who plays a sport at a qualifying New Mexico university may apply. Students may renew this scholarship each year. Schools determine specific qualifications.